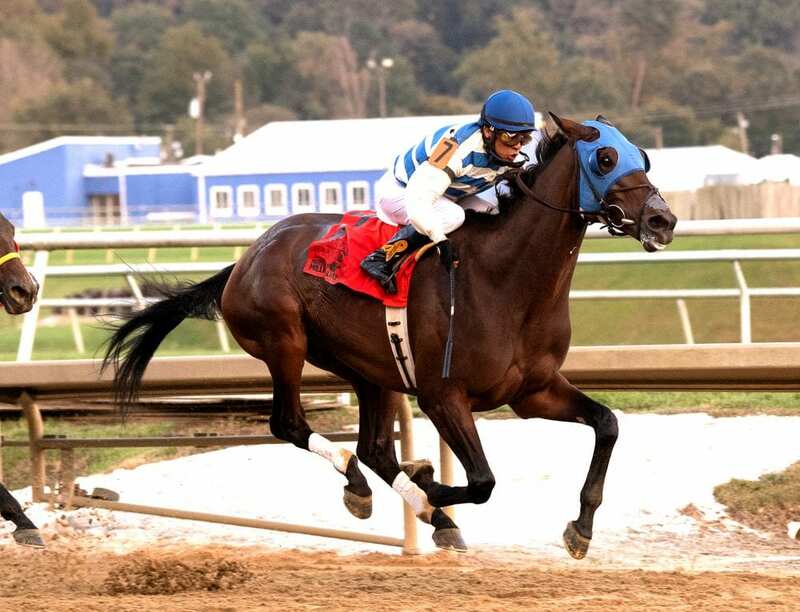 Hall of Fame jockey Edgar Prado guided Saratoga Bob to victory in Saturday's $150,000 Maryland Million Classic at Laurel Park, setting a record for most wins by a jockey in the annual event featuring Maryland-sired and Maryland-bred horses. Prado notched his 18th Maryland Million success, going one-up on retired fellow Hall of Famer Ramon Dominguez. The Classic, a 1 1/8-mile race for 3-year-olds and up, headlined Saturday's 33rd edition of Jim McKay Maryland Million Day, which also featured the inaugural Clubhouse Festival, a daylong concert showcasing several prominent musicians, including Grammy nominated Steve Aoki. Prado, who ranks eighth all-time with 7,017 winners, dominated the Maryland circuit for many years before moving on to achieving fame in New York and returning to his Hall of Fame roots two years ago. Saratoga Bob, the 7-2 third betting choice, broke alertly to press the pace set by Pal Cal, who showed the way around the first turn and on the backstretch past fractions of 24.46 seconds and 49.09 for the first half-mile. Prado maintained his position board the 4-year-old son of Friesan Fire into the far turn before taking over the lead turning for home. Saratoga Bob put away a challenge by Clubman at the top of the stretch and was all-out to hold off the late challenge by Dothat Dance by a half-length. Clubman, the 7-2 second choicer, finished third, another three-quarters of a length back. Admiral Blue, the 5-2 favorite, showed brief speed before fading to ninth in the field of 10. Saratoga Bob ran 1 1/8 miles in 1:51.28 to score his first stakes victory for owners Wayne Harrison, Robert Manfuso and owner/trainer Katharine Voss. Saratoga Bob has won three times and has never been worse than third in six starts with Prado aboard. He was bred in Maryland by Voss in partnership with Manfuso. Blocked by a wall of horses for nearly six furlongs, Dr. Michael Harrison's Talk Show Man found room on the far outside turning for home and used the length of the stretch to run down favored Phlash Phelps for a half-length victory in Saturday's $125,000 Maryland Million Turf at Laurel Park. The one-mile Turf for 3-year-olds and up and the $125,000 Ladies for fillies and mares 3 and older were among seven stakes and four starter stakes that helped comprise the 33rd Jim McKay Maryland Million Day program, the groundbreaking concept named for the late Hall of Fame broadcaster that debuted in 1986. Talk Show Man's victory kept 3-5 favorite Phlash Phelps from becoming the first horse to win the Turf three times and just the seventh to win for a third time in Maryland Million history. It was the second Turf win for Talk Show Man, who also finished first in 2014. Talk Show Man ($8) finished up in 1:38.64 over a yielding All Along turf course to give Smith his eighth career Maryland Million victory and jockey Jevian Toledo his third on the day and second in a stakes, following the $100,000 Sprint aboard Lewisfield. The early pace was set by 25-1 long shot Grandiflora, who went the first quarter-mile in 25.23 seconds and the half in 49.81 pressed by No Bull Addiction with Phlash Phelps in the clear four wide and Talk Show Man and Toledo biding their time saving ground from their inside post. Grandiflora and No Bull Addiction continued to battle into the stretch as Phlash Phelps got his cue from jockey Victor Carrasco and Toledo followed their move by tipping Talk Show Move to the far outside. Phlash Phelps, who broke a step slow from the far outside post, forged a short lead past the sixteenth pole but Talk Show Man continued to gain ground in the middle of the track to get up in the final strides. Talk Show Man was racing for just the second time this year after a 10-month break between races. In his lone previous start, he came from far back to be fourth, beaten three lengths, in the six-furlong Laurel Dash Sept. 22, also contested over a yielding surface. The win was the eighth from 36 career starts for Talk Show Man, boosting his bankroll to $453,306. He also won the Henry S. Clark Stakes in 2015. “He's been one of the soundest horses I've ever trained. The owner wanted to give him some time and he deserved it. When he came back he just kind of cramped up and wasn't hitting the ground right and we don't know what it was,” Smith said. “We sent him back home and they turned him out in the paddock and left him alone and he kind of took care of himself. John and Cheryl Banner's homebred My Sistersledge swept to the lead at the top of the stretch and fended off a challenge from 60-1 long shot My Vixen in the final sixteenth to earn her second straight victory in the $125,000 Maryland Million Ladies. Favored at 3-5 in the field of nine, My Sistersledge ($3.20) ran 1 1/8 miles in 1:55.74 over a yielding Dahlia turf course to win by a neck. Stablemate Magician's Vanity was third, 1 ¼ lengths behind My Vixen, who was making her stakes debut in her 22nd start. It was the second straight win and third in four starts for My Sistersledge, giving trainer Mike Trombetta his eighth career Maryland Million victory and jockey Julian Pimentel his 12th. He later won No. 13 with Follow the Dog in the $100,000 Nursery. My Vixen led through a quarter-mile in 24.12 seconds and a half in 49.48 tracked by Love's Legend and Hot Friesia with Magician's Vanity saving ground inside. My Sistersledge began to pick it up in the clear four wide around the far turn, forging a short lead and holding off a stubborn My Vixen through the lane. My Sistersledge won last year's Ladies by a nose in a 5-1 upset over even-money favorite Great Soul. The 4-year-old filly by Etched out of the Miesque's Son mare Blushing Bride owns six wins from 20 career starts and is 4-1-3 from eight lifetime tries on the Laurel turf. This entry was posted in NL List, Racing and tagged edgar prado, hall of fame jockey, Katharine Voss, laurel, laurel park, Maryland Million, Maryland Million Classic, ramon dominguez, saratoga bob, talk show man by Press Release. Bookmark the permalink.